In our last article, we talked about the importance of crafting (and insisting upon) a naming strategy for digitally submitted work. This alone can be a valuable management strategy, but staff can put other measures in place to maintain a sense of sanity as more student work is turned in online. This post focuses on a Folder Sharing/structure solution within Google Drive. One of the core truths in Google Drive is that when a folder is created in Drive, the "properties" set for that folder are transferred to any documents or files within that folder (unless otherwise specified). The Folder Sharing Concept, then, focuses on using this principle to eliminate later confusion/frustration as students create one folder, set the sharing and viewing properties properly once for that folder, and then simply place all course related work in that folder for the rest of the year. This keeps an open line of communication between the student's course folder, and the teacher's access to that folder. It is recommended that a teacher launch the Folder Sharing system with all of his/her students at a time when it makes sense to change fundamental operating procedures within the classroom. Moving all students at once to this system will make the transition cleaner and more manageable for the instructor. It also allows the classroom culture/expectations to shift at once. Do you want folders inside of that folder (nested or sub folders)? What level of sharing would you like students to give you? Viewing? Commenting? Editing? Once students share a folder with you, it will benefit your efficiency to place those folders into a collective folder. Name the folder with clear identifiers, though. "American Lit - 2012 - Sem1"
While students can create this independently, it is worth the time and effort to be present to answer questions and to make sure the folder is set up properly the FIRST Time. Step 4: As students share the folder with you, check the properties and drag into your "Class Folder"
When the file arrives in your inbox, or in your Google Drive folder (look in "Shared with Me"), take a look at the properties to be certain they are set properly. Then, simply drag the folder up into the proper "Class Folder" in your Google Drive. You will not delete student access to the folder in dragging this into the "My Drive" section of Google Drive. It simply makes it easier for the instructor to find like student folders. Remember that all files within that folder will take on the "properties" of the folder, unless otherwise specified by the student. Developing a file naming structure/code for the files in each folder will further assist instructors in efficiently assessing the work within that folder. While the system is fairly simple and easy to use, there are some strategies that will make this work more seamless. Clear initial expectations will ease the student transition to a new turn-in model. Avoid accepting paper versions of the work when possible if the expectation is primarily electronic submission. Prior to using Google with students, determine if they have an active Google account with the district. The easiest method is to have students attempt to log in. Encourage students to share their folders with a parent/guardian as well. Even without a Google account, parents can view (and even comment/edit) the work. 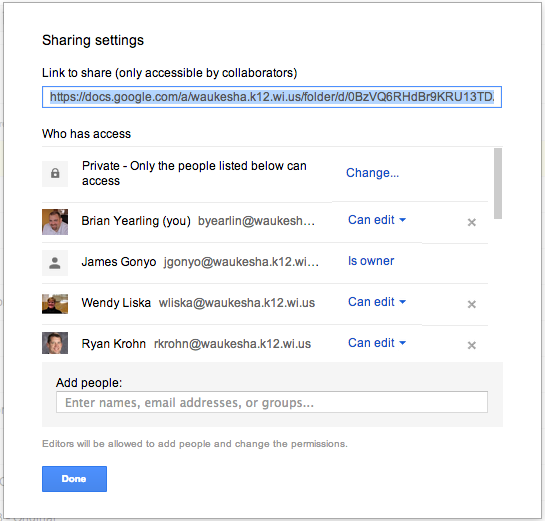 Here's a link to an article explaining options for sharing with non-Google users. Use commenting on docs shared with you to provide feedback. Printing assignments and placing feedback on the printed copy defeats the purpose of e-submissions (and creates another step for you -- so much for efficiency gained). Engage students in a discussion about the work using the discussion tool in Google Docs. Check in often. You'll be amazed at how quickly work piles up. Even when it isn't due!